If your upgrading the rear speakers in a Toyota Camry 2006-2011 (XV40) that is equipped with the factory premium JBL sound system, this tip may help. This is what the factory rear speaker should look like once removed. As you can see there will be four wires pinned in the factory speaker harness. You can easily identify the positive and negative wires by using a AA battery to pop the speakers, that is if the speakers are still functional. If you aren't familiar with how to test a speakers polarity with a AA battery, I will be explaining the process in a new post within the next day or two. Once you have identified the positive and negative wires, for both the tweeter and the mid-range speaker cut the factory speaker harness off the factory tweeter and mid-range speaker. Leaving as much wire in tacked to the factory speaker harness as possible, you will need it to wire your new Alpine speaker. 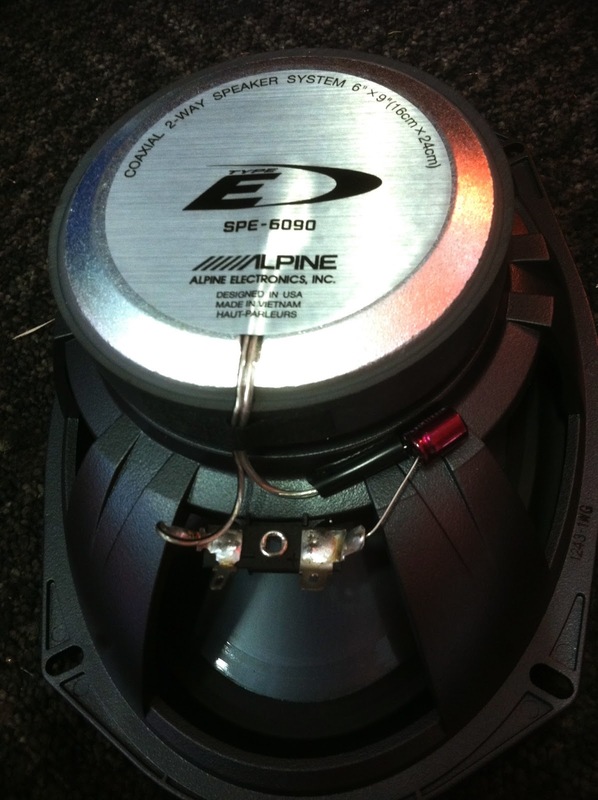 I will be replacing the factory speakers with these Alpine Type E (SPE-6090) aftermarket speakers. 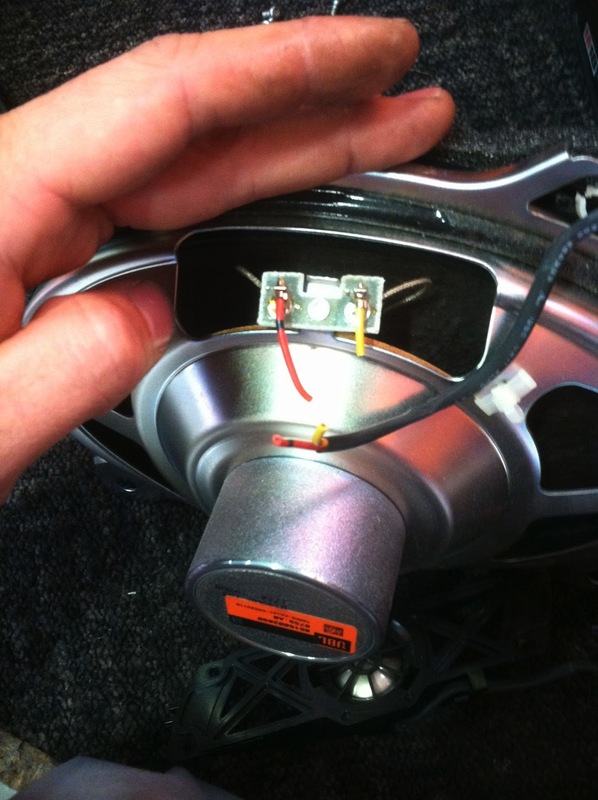 You will notice on most coaxial speakers the leads for the tweeter taped to the side of the magnet. In order for these speakers to work properly in these vehicles you will need to wire the tweeter and the mid-range independently. 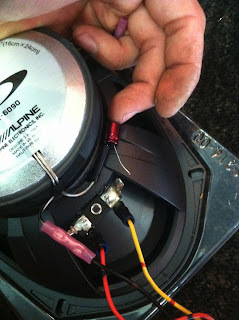 Because the output going to the factory tweeter and mid-range speaker is already crossed over, if you just connect one pair of the factory speaker wires to the new Alpine speaker you will either get just the high frequencies or just the low frequencies playing out of your new speaker, depending on what pair you connect. You can't just connect both pairs of factory speaker wires together to get full range, you would need some sort of summing module. I have already identified the wires in this vehicle "Red" wire is the mid- range speaker negative and the "yellow" is the mid-range positive. 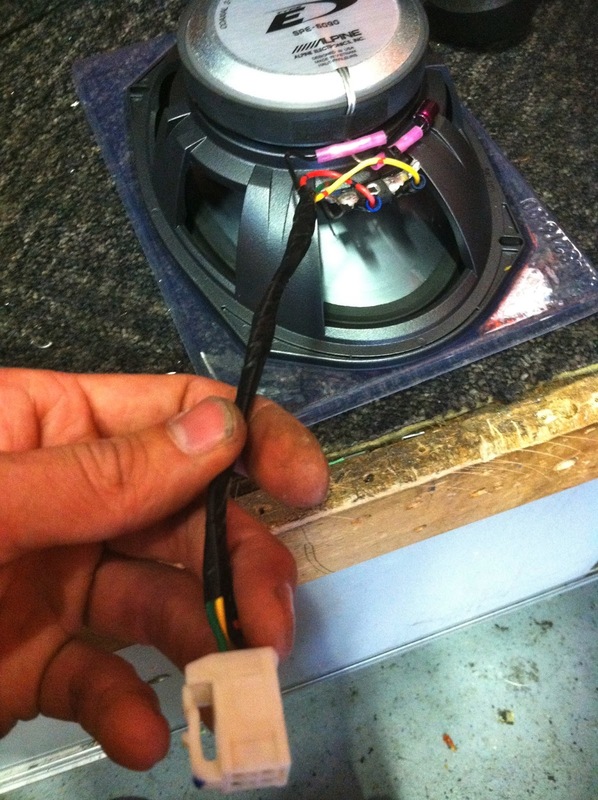 You can then cut the tweeter wires off the main terminals on the new Alpine speaker. The wire with the black stripe on the left of this Alpine speaker should be connected to the negative tweeter wire, which should be the "Black" wire coming off the factory speaker harness. 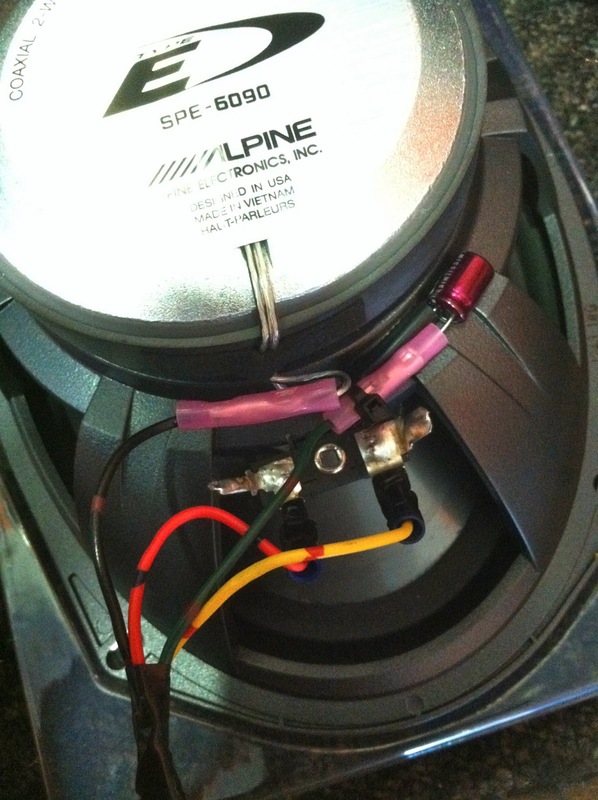 Then connect the last wire which should be the "Green" wire coming off the factory speaker harness to the wire coming off the small capacitor mounted to the side of the Alpine speaker. If needed use a couple small zip ties to keep everything in place. It's now time to plug the new Alpine speaker into the vehicle and secure it using some new mounting screws. 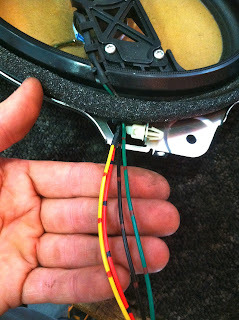 Now just repeat the process on the other speaker, the factory wire color on the speaker harnesses should be the same on both sides. Thanks for the great guide and pictures. 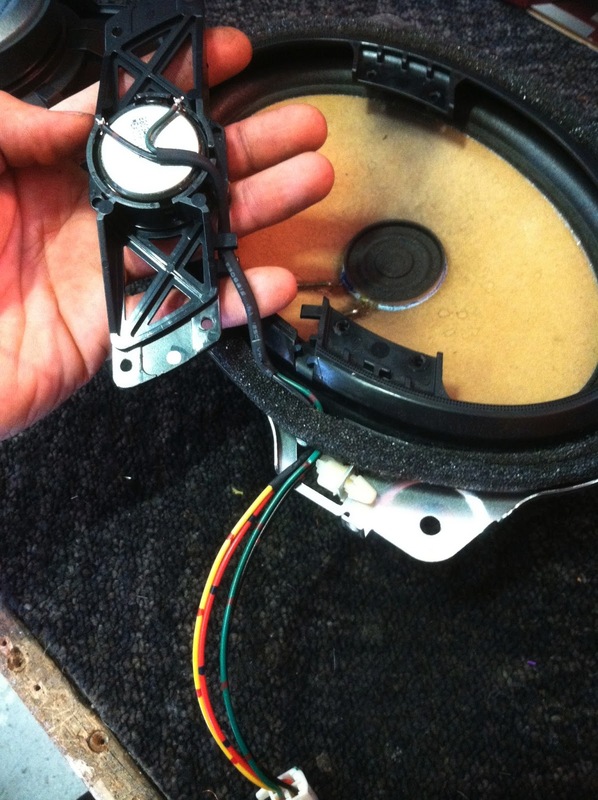 Do you know if the same process to rewire the tweeters is necessary for a 2000 Camry JBL system? Thank you Jeremy,I'll check back with you if/when I need some help . I have a used 2008 Toyota Camry that came without the rear speakers working. I checked the trunk where the speakers were located and the wires on both speakers seemed to have been cut clean. How can I make my rear speakers work? Is it possible for me to just reconnect the wires? Are the speakers factory? Or did someone switch them with a pair of aftermarket speakers? If they are the factory speakers, someone may have cut them because they were not functioning properly. Do you have a digital multi meter? I would test them first before reconnecting them. I'm looking at replacing the entire audio system in my 2004 Toyota Avalon. Head-unit, speakers, sub-woofer; everything. Should I replace or simply bypass the amp? What about wiring? Seems a shame to install better equipment and continue using the same thin gauge wire, particularly if I install a more powerful amplifier. What are your recommendations? Hey Zac, If you're going to be replacing all of that you would probably be better off completely bypassing the factory amp. 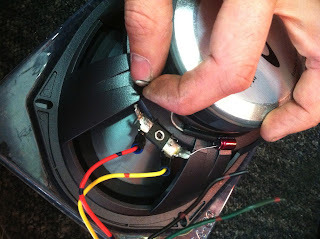 As far as upgrading the speaker wiring It really depends on the equipment you're installing. Most of the time when you calculate the numbers between 16-18 gauge, or even 12-18 the difference is so minimal it really does't make any sense to re-run new speaker wires. lets say you have 18 gauge wire and it runs 10ft to a 4 ohm speaker, and your amp is outputting 100 watts. The decibel loss would be .27 (anything under 1 is inaudible). The power that will make it to the speaker will be 93.94 watts. Now change to a 12 gauge wire, the decibel loss would be .07 and 98.43 watts would make it to the speaker. So upgrading all the speaker wires to 12 gauge, which would be considered very large speaker wire by most, would make a difference. But it wouldn't be an audible difference to the human ear. So the question would be, is it worth spending $100 maybe more and hours of labor on something that won't make an audible difference? Hope this helps a little bit! Thanks for the comment! Thanks a lot for posting this, I've just learnt one of my rears has been damaged in my 2011 Camry so I think I'll go the aftermarket route. No problem, thanks for checking out my site! I'm just looking at the pics you posted; what's the best kind of crimp connector to use for the tiny Alpine tweeter wire? It looks like pretty small gauge and wonder how you went using a typical cable crimp connector? Hey dan, soldering would be the best way to go. If you have to use crimp connectors like I did in this install, the seamless nylon 18-22 gauge connectors worked just fine. I have used the seamless nylon 24-26 gauge connectors as well, they work great for the smaller gauge wires but are pretty hard to find. Here's a site that still sells the 24-26 gauge connectors. Hey Kurtis, have you tried adjusting the Bass from the factory stereos audio settings? Is it the same process as far as the wires go for the front doors too? Do you know if these same speakers would fit in the front doors? I have a 2011 Camry SE with the JBL system and the front passenger side door speaker is blown and the rear deck driver side speaker is blown and I'm pretty sure the rear deck passenger side is about to blow. Hey thanks for checking out my site! The process will be different for the front speakers. 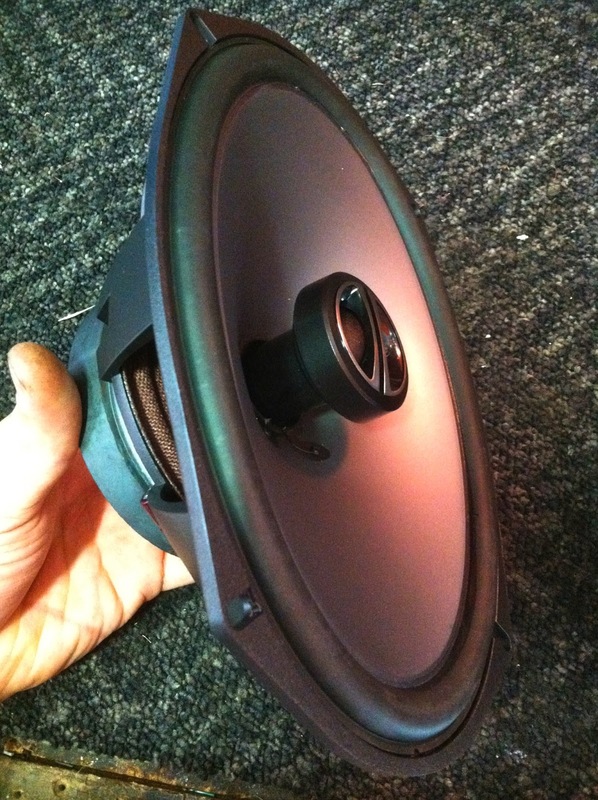 You will have separates/component speakers, so your mid 6x9 speaker and tweeter will be mounted and wired separately. The front door mid range 6x9 can be replaced with an aftermarket 6x9, but you will need the 6x9 speaker spacers. Are they not playing any audio? Or do they make a bad rattling/vibrating noise? You may just need to replace the foam surrounds. If so you can normally find a repair kit for about $20-$40 for the two fronts. They make the rattling/vibration noise, even with the bass turned all the way down. Seems kind of pathetic given that the sound package is an "upgrade". When looking for a foam surround, is there a specific one I should get or just one that fits a 6x9? Where would I find the speaker spacers for the front doors? Do you have any suggestions as to which speaker would sound best in the front and rear? I'm able to figure this kind of stuff out with instruction but I have no idea what I'm looking for when picking out speakers. It sounds like it could be the foam surrounds. The only way to be sure, would be to remove the speakers and visually check the foam surrounds for damage. they have a toll free number if you have questions about the kits. For the price Alpine makes a couple good paires of 6X9s, so does Infinity. It really depends on what kind of sound quality you're looking for, and how much your willing to spend. Hey Jeremy, sorry to keep bugging you but I've been doing some digging and came across a speaker I think I like for the front and I wanted your opinion if possible. I am looking at the Infinity Reference 9632cf for the fronts. I also want to replace the rears but my question there is, is it best to have a two way speaker for the rear deck or a three way speaker? Same question for the front speakers. Again I have the JBL system in my Camry. I found all the adapters/spacers through the links you provided. Thanks for the help! This was an outstanding guide- I used it all the way through my work and besides a speaker adapter, it was 100% on point. Nice write up. Seems like its hard to find info on the rear Camry speakers. My question is, why doesnt any one such as Crutchfield reconizes the speakers as 6x9's? Thxs! Thanks! Yeah, I would agree. I don't know for sure, but there are so many different factors. Not only the year, make, model, of the vehicle but also the sub-model, and location in which it was manufactured, even with all that info the sound system package may still be different. They may have gathered all the info from a Toyota Camry of the same year, but a different sub-model or different location not equipped with this same JBL sound system. Sometimes the only way to know for sure is to take a look. Hey does this same process have to be done on the front speakers as well? I tried replacing the 6x9's in my front door and all I got was low freq. Im a little confused as to what types of speakers I should be looking for to replace my fronts. I have a 2008 Camry with the JBL system. Any help would be great. Thanks! For several years I'd considered upgrading the rear speakers in my 2009 Camry Hybrid with JBL. Finally one rear speaker developed voice coil rub and I was put on the spot. When I inspected it, I realized it was bi-amped with active equalization. Hadn't realized how wimpy the OEM speakers were. The woofer measured 2 Ohms. I spent the better part of two solid days researching 2 Ohm 6 x 9's with reasonable lows, a high SPL and as large a rare earth magnet as would fit without hitting the trunk spring rods. Even taped a 4 inch diam cylindrical Tupperware bowl over the original speaker's magnet to emulate the new speaker's magnet clearance. With the right new speaker, I was sure I could separate the tweeter from the crossover, properly phase it and splice it directly to the original 4 pin male connector, but........... Then I found your website and saw you'd actually done it. Great encouragement. A pair of JBL GTO928's and adapter plates are in the mail. Hopefully, they'll fit without metal work. Thanks and Gratitude from a 72 year old medical electronics designer. The GTO928's fit comfortably. With 1/4 inch mounting plates, the trunk lid torsion bars clear the magnets by about 3/8 inch. The magnets can't be any wider or deeper. The 928's use an LC crossover, with an inductor in series with the Woofer + and a capacitor in series with the tweeter (+). On the premise that (+) makes each cone move up (towards the rear window), the RED lead should go to the old and new Woofer (-) and YEL lead to the Woofer (+). The BLK lead to the Tweeter (-) and the GRN lead to the Tweeter (+). With a signal generator, the 928 is only 3 dB down at 29 Hz. There were two nasty deck resonances at the speaker's natural resonant frequency of 45 Hz. One was the hybrid battery vent that needed a bit of addl foam where bare plastic contacted the metal deck. The other one was the center seat belt retractor, just in front of the Driver side speaker. I had to unbolt the retractor and wrap one solid U-shaped piece of 1/2 inch soft foam sheet in the basket, around the bottom and two sides of the plastic take-up reel covers. Make sure the foam doesn't interfere with the belt or reel. Sides and bottom only. One piece of foam will stay in place. CAUTION!!! put a clamp on the belt before removing the reel. If ANY of the belt retracts, it can be a multi-hour trial figuring out how to overcome the deceleration trigger ball and associated locking ratchets. If you can't find instructions, you may have to replace the take-up reel. Leave the clamp on the belt until the reel is back in place. Even though the 928s are 2 Ohms, their SPL is a couple dB lower then the OEMs, so the back speakers have to be dialed up slightly and the fronts dialed down. I also had to switch the new tweeters to the -3 dB position, otherwise they are a bit too sybilant (lispy). Hi - your tips are great! I am trying to replace the rear speakers in my 2011 Camry hybrid. The problem is that the bolt hole locations are different compared to most of the after-market speakers I have found. Do you know of adapters that will help or do you have any other suggestions - other than pay through the nose for the toyota factory replacements? Trying to do the same with my 2011 Camry Hybrid, but not help so far. I'm trying to figure out what after market speakers to put in the rear dash. Anyone please. I understand what you're trying to do with the tweet and mids +/-. But the alpines run at 4 ohms and you're installing it into a 2 ohm factory stereo system. How was the quality and power of the speakers after you did this compared to the OEM speakers? I have the jbl navigation system for an 07 camry. The rear speakers were blown and the dealer installed some aftermarket dual 6x9s. The speakers sound nothing like the factory. The front speakers are louder than the rear. Is it the speakers or is it possible that they were wired wrong. What does it sound like to you? Can I put an Infinity 9632cf in my 2006 Toyota camry Le? I have a 2014 Toyota xle Toyota Avalon.this is a standard stereo system which the rear speakers even when turned up loud as can be have very low volume.even when it is set only in the rear what could be causing such low volume? I have a 2014 Toyota xle Avalon with a standard radio and the stereo part has very low volume that can be heard from the rear even when everything is set to the rear.what could be the problem for such low volume output in the rear speakers? My 2015 camry hybrid XLE JBL audio only has one speaker in the rear deck... well a 6x9 and a smaller tweeter I guess. And then no speakers in the door and then about 6 speakers up front or something... I don't know why I bothered getting a JBL system. With that said I would be surprised if your upper model Avalon is that cheep also. do you have pictures of how you take off the back panel of the camry to get to the speakers? Hello, I'm sorry I was hoping that I did but I couldn't find any. What year is the Camry? If you'd like you can start a topic in the forum and I can try and walk you through it. Any chance you know the gauge for the wires from the stock jbl speakers? (The red, yellow, black, and green wires). can u change the amp over in a 2012 camry SL with the JBL system in it? Hey Jeremy...Great illustration of how to replace the rear speakers in a camry with Alpine speakers. I am looking to do the same to my 07 Camry with the JBL premium sound system but have one issue with your recommendation. It is a question that was already asked but not answered; the Camry JBL premium sound system works on a 2 ohm platform. Could you please quantify how you get the same performance out of the Alpine speaker you recommend using that is a 4 ohm type. The math formula for sound does not equal out to good performance. installed the GTO938 on my 07 Camry and the sound was very low. Even when the volume is fully open, the sound is not very loud. I have the JBL audio system, anyone else experience this problem? Any suggestions? 1999-2003 Honda S2000 Tach Wire For Remote Start. Retain Factory Aux Plug With Aftermarket Stereo.